Hallagenna is our family-run, horse riding business. 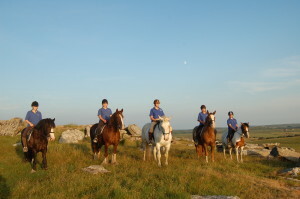 We’ve been riding on Bodmin Moor for many years – and we still love it! Not only do we get to enjoy one of the most dramatic, unspoilt areas in the country but we also get to sharing this unique experience with our visitors. Paul – Paul looks after the general smooth running of Hallagenna. Paul has worked with horses for more than thirty years, competing up to Grand Prix Dressage and Advanced Eventing levels during the 80′s and 90′s. His classical training and international experience have seen Paul involved in many different equine areas, including the breeding of competition horses. Our Instructor- Paul’s daughter has grown up around horses, competing at pony and riding club level since the age of 10. Beginning her training life with 3 years at the Talland School of Equitation in Gloucestershire, Paul’s daughter has spent the past 7 years training and competing at some of the best yards in England. She has evented in the USA and experienced training in Spain, expanding her equine knowledge and experience in various areas of the equine world. She now manages the Yard at Hallagenna alongside her Team of Riding Escorts and Assistants. They all love sharing the experience of our horses and fantastic moorland riding with our visitors and guests. She aims to achieve an excellent rapport with our guests on riding holidays, as she conveys her knowledge, teaching to build their rider confidence throughout their holiday, especially children. Her other passion lies in competing and she especially enjoys training young horses for competition. To find out more about riding at Hallagenna, please call us on 01208 851500 or email us.